Today is adding to the accumulated pain of the last few days for most funds. Momentum has retraced nearly all of its YTD gains and names with high active ownership are underperforming names with high active ownership by 3 standard deviations. This is becoming dangerous because as managers give back P/L and approach flat on the year a broader de-risking is more likely. While a crude estimate, the below shows rolling returns of reported longs per 13F filings versus the broader market. 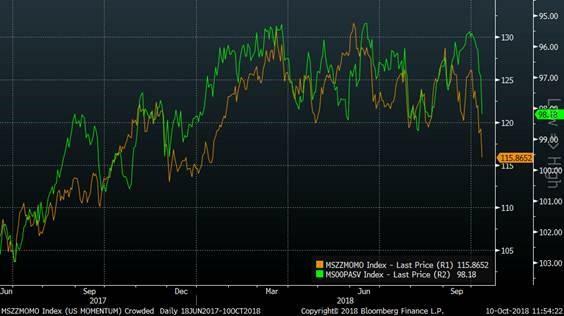 On the left is the last 2 weeks – nearly as negative as late July, while on the right is the last 3 months (so combines July and now) – the worst underperformance since Feb 2016. So far the unwinds are rotational, keeping index dispersion in-line with historical averages. Notably most of that dispersion is at the sector level while most single names within sectors are trading together, indicating the pain is in sector/factor/thematic trades. But given the overlap of crowded stocks with the market (i.e. Tech = largest sector), the pain is spreading to the index level. And on the back of today’s moves there will now be some systematic supply – QDS estimates $10 to $15bn total over the next several days. This supply could start to move the volatility from sectors / factors into the index level as correlation increases.